Abundance is the word that sums up this time of year. Even though the days are starting to get noticeably shorter, in the garden and in the kitchen it's bursting with delicious things to eat. There are tomatoes of all shapes and colours, a glut of zucchinis and the stone fruits keep on coming. My friend Lara has a lovely garden, over an acre in size, filled with generous old fruit trees with sweeping boughs that groan under the strain of so much fruit. 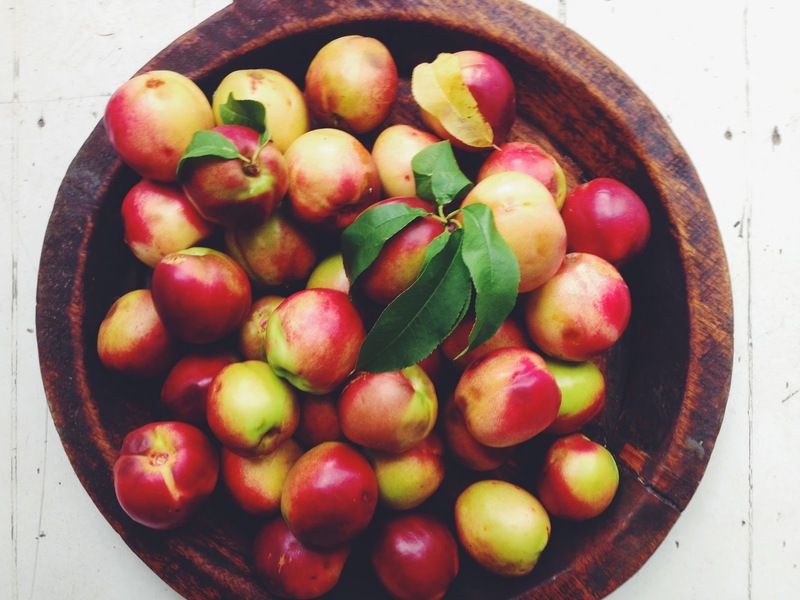 Every visit I leave with a bag full of perfectly ripe nectarines or dark blood plums, which we eat as quickly as we can, or make into jam or freeze them or poach them to have with yoghurt for breakfast. These will be followed by nashi pears and golden delicious apples to add to the coming autumn harvest. Then there's this cake, an old favourite from a book called Luscious by Michele Cranston. A moist chocolate cake studded with plums and dark brown crunchy topping, I've been making it for a few years now and I still never get tired of it. It's perfect cake to use up the abundance of the season. Preheat oven to 180c. Grease a 25cm spring form cake tin. Put the brown sugar in a bowl with 30 grams of the flour and mix together. Add 3 tablespoons of the butter (leave the rest to soften to room temperature) and rub the butter in with your fingertips until the mixture resembles course breadcrumbs. Sift the remaining flour, into a mixing bowl along with the baking powered, cocoa powder and salt. Put the caster sugar and softened butter in a separate bowl and cream together using electric beaters, then add the eggs and mix well. Add half the flour mixture, then half the milk mixing well after each addition. Mix in the remaining flour mixture then the remaining milk. Pour the cake batter into prepared tin and arrange the plum halves cut side down. Sprinkle with brown sugar mixture and bake for 50 - 60 minutes or until a skewer inserted in the middle comes out clean. That's definitely a recipe to try, and I love your photos.